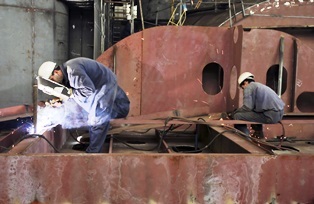 Maritime work can lead to serious lung conditions, including mesothelioma due to prolonged asbestos exposure. Ironically, asbestos products were once used on ships in an effort to protect the crew and cargo from fires. Yet the presence of asbestos may have been the element that endangered workers the most. Asbestos is a strong silicate mineral long used in manufacturing and construction due to its excellent fire resistance and sound absorption. Since fires at sea are disastrous, asbestos was frequently incorporated throughout boiler rooms, engine rooms, and sleeping quarters. Asbestos was used as insulation, and it could be found wrapped around engines, boilers, steam pipes, and exhaust pipes. It was even mixed into the paint coating many vessels. When asbestos fibers are disturbed, they may become airborne and subsequently inhaled and trapped in the lining surrounding the lungs. This is particularly a problem for workers in engine rooms, where ventilation is poor. Asbestos exposure can lead to devastating ailments, including lung cancer, asbestosis, and mesothelioma. Mesothelioma is a rare form of cancer that is often caused by routine exposure to asbestos, and about 3,000 Americans are diagnosed with mesothelioma each year. It often grows silently for years without exhibiting symptoms until 25 years or more after initial exposure. Mesothelioma growth typically begins around the lungs or the abdominal cavity, causing labored breathing, chest pain, decreased energy, and excessive coughing as the illness progresses. Surgery, radiation, and chemotherapy are possible treatment options. These are expensive medical procedures that will likely cause a mesothelioma patient to miss many hours of work. If you were diagnosed with mesothelioma due to asbestos exposure, you deserve compensation for your medical expenses, loss of income, and pain and suffering. You need representation by an experienced maritime injury attorney to help you secure this financial reimbursement for your work-induced illness. To learn more, contact the law offices of Steve M. Lee, P.C., by clicking the Live Chat button on this page.